Chinese lucky animals - what are they? According to the Chinese tradition of Feng Shui, there are certain animals that bring good luck, prosperity, wealth and any kind of good fortune. Keeping the symbols of these animals, their pictures or the animals themselves at home or around the house is extremely beneficial for the favorable energies that they bring to our lives. These animals are: fu dogs, dragons, goldfish, three-legged frogs, bats, cranes, elephants and turtles. Dragon is the most famous symbol of luck in the Chinese culture. The presence of the pictures or symbols of dragon attract the positive chi of good luck. Feng Shui masters often have the image of the dragon on their clothes in order to attract the favor of the mythical animal. 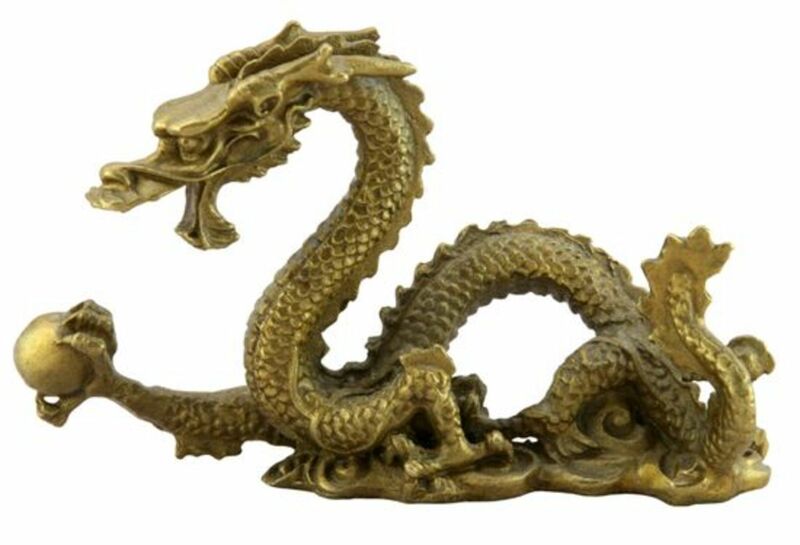 The images of dragon in your home and office attract the powerful chi that stimulates the raving growth of the wealth. 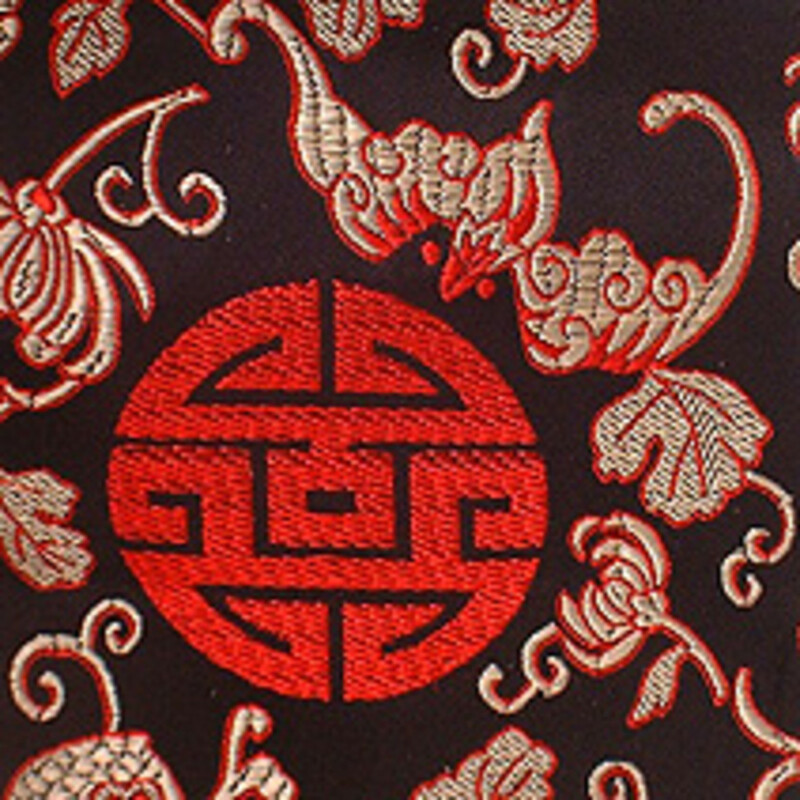 Red, green and violate dragons are especially beneficial – traditional Chinese culture associates these colors with prosperity. The dragon playing with the pearl attracts the wealth as well. You can choose the decorations that include the symbolism of the dragon: statues, panels, dishes, vases and other objects. So you can fill your home with images of dragons but make sure that at least one of them is situated in your wealth area. If you have ever been in China, you must have seen them: a pair of ferocious, flat-muzzled, lion-like stone creatures that stand at both sides of entrances and paths. 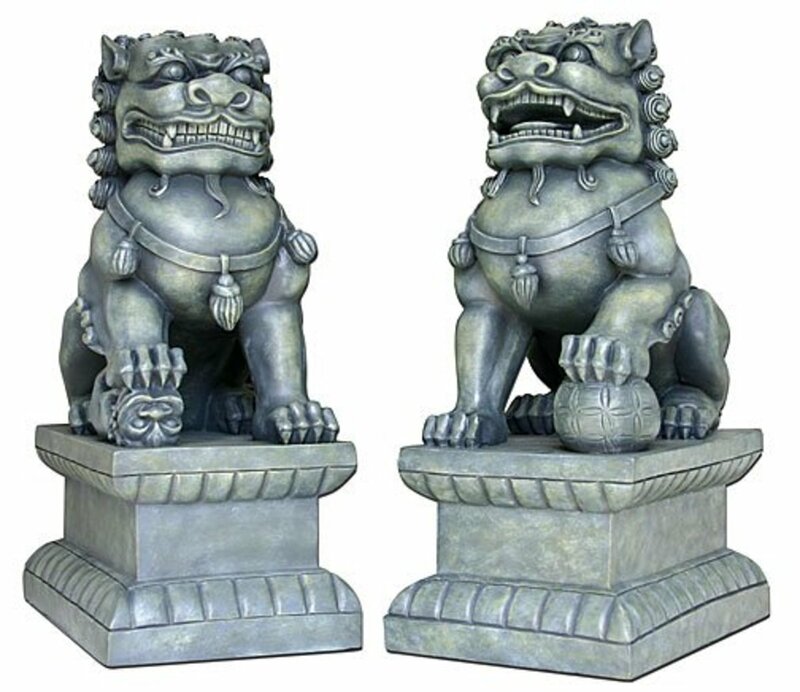 These are fu dogs, also called buddha's lions, mythical guards of the homes since ancient times, still popular everywhere in Asia. 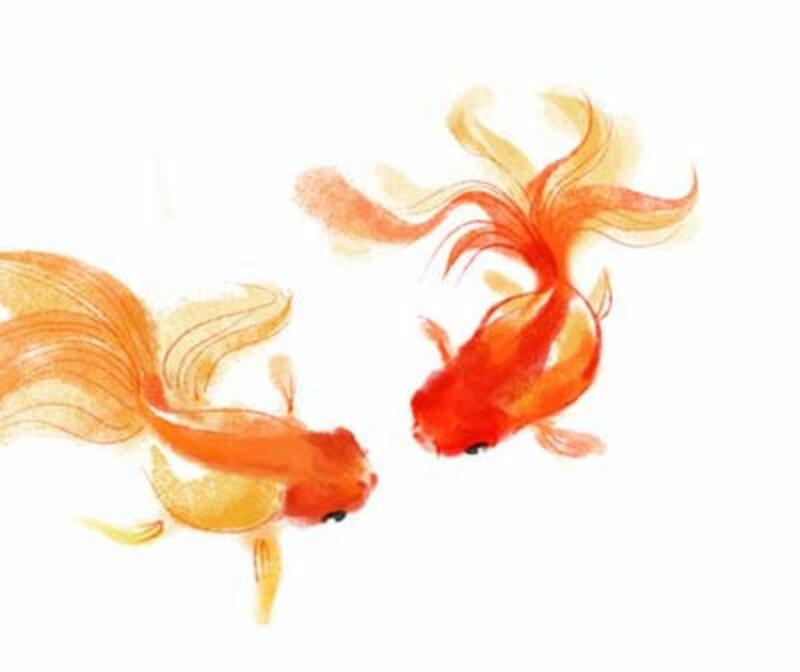 Goldfish are thought to bring good luck because their movements resemble the movement of healthy chi energy. Besides, goldfish looks like gold after which it was called. Many Feng Shui specialists argue how many goldfish there should be. But there aren't bad numbers. All of them are good if the goldfish is healthy. In general, though, uneven numbers attract more of lucky energy that brings growth – this is the energy that you need to make your wealth grow. Meanwhile, even numbers attract the kind of energy that helps keep and preserve your wealth. 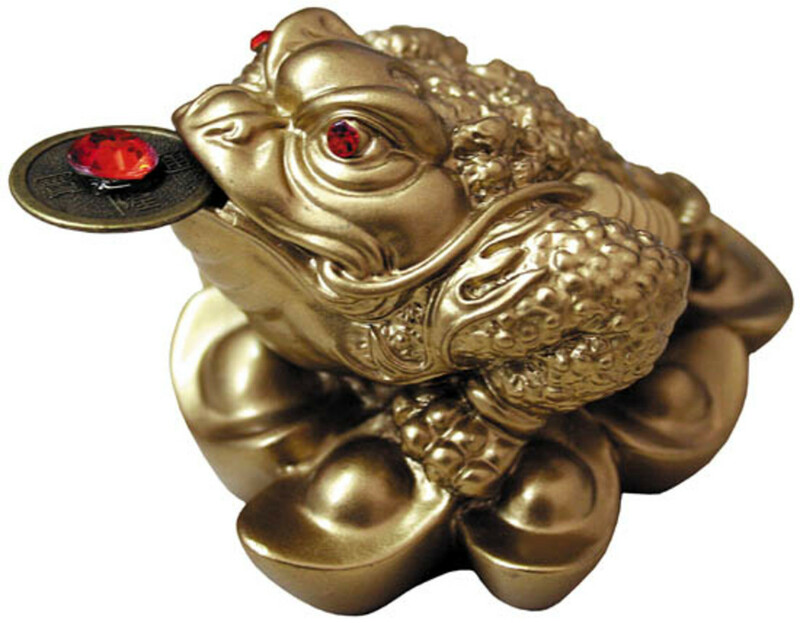 In many Feng Shui shops they sell the statuette of a three-legged frog with a coin in its mouth – the character of the famous Chinese fairy tale. This story tells how a frog saved from a well brought its saviour gold coins from a hidden treasury. The frog statuette symbolizes money that comes from an unknown abundant source. It is advised to place the statuette at the entrance. The story goes that many centuries ago Lu-Hai the immortal (this is the name of a character of the Chinese folklore) saw a frog on the bottom of a well. The frog only had three legs so it couldn't jump out. The philosopher saved the frog. As a sign of gratitude it brought one coin per day from a treasury hidden somewhere... till Lu-Hai became a rich person. The statuette of this frog reminds of this story and symbolizes the eternal wealth growth. 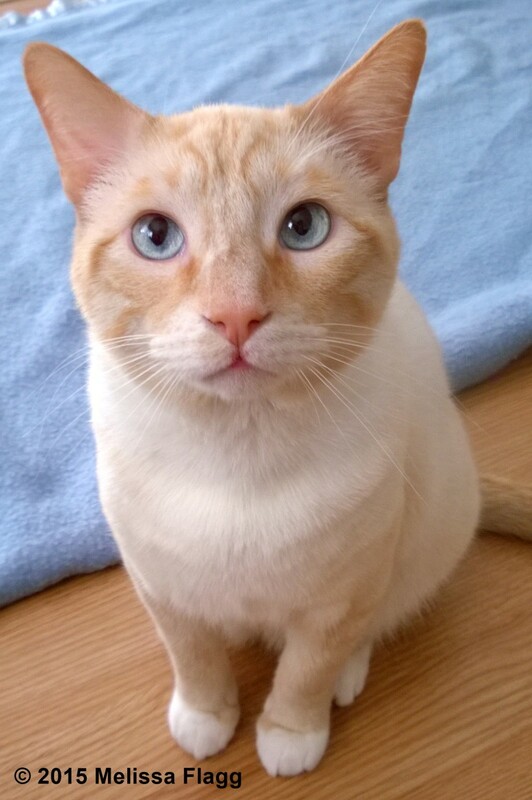 Do you have any animals of good luck in your home? In Chinese culture many animals are associated with wealth. Red bats are thought to attract money fortune. 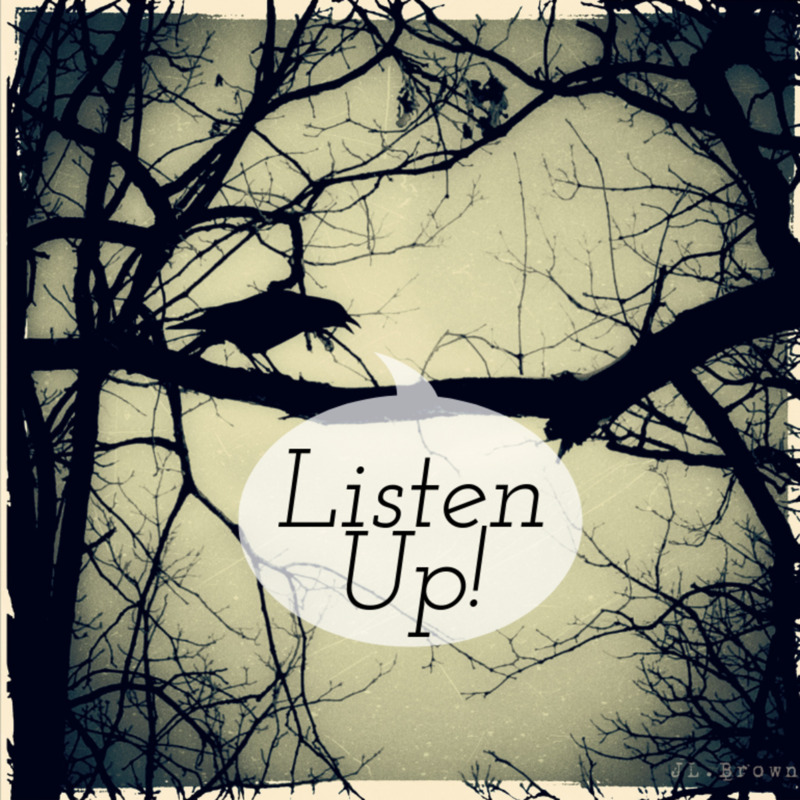 You are lucky to have bats in your house or nearby but even the images of bats can bring good fortune. Crane symbolizes longevity and good luck. 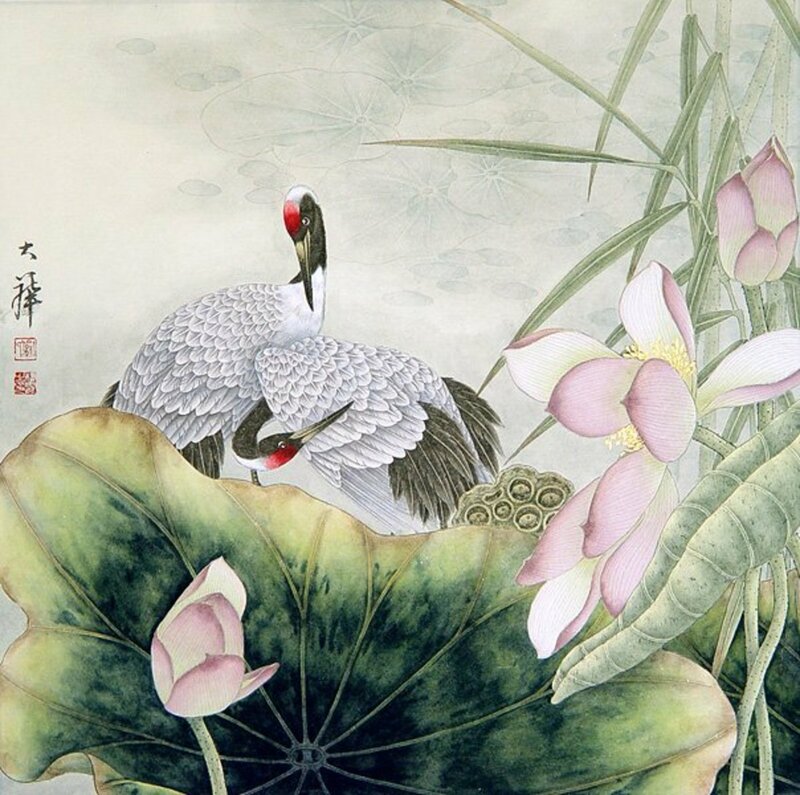 It is present in numerous works of the Chinese art. 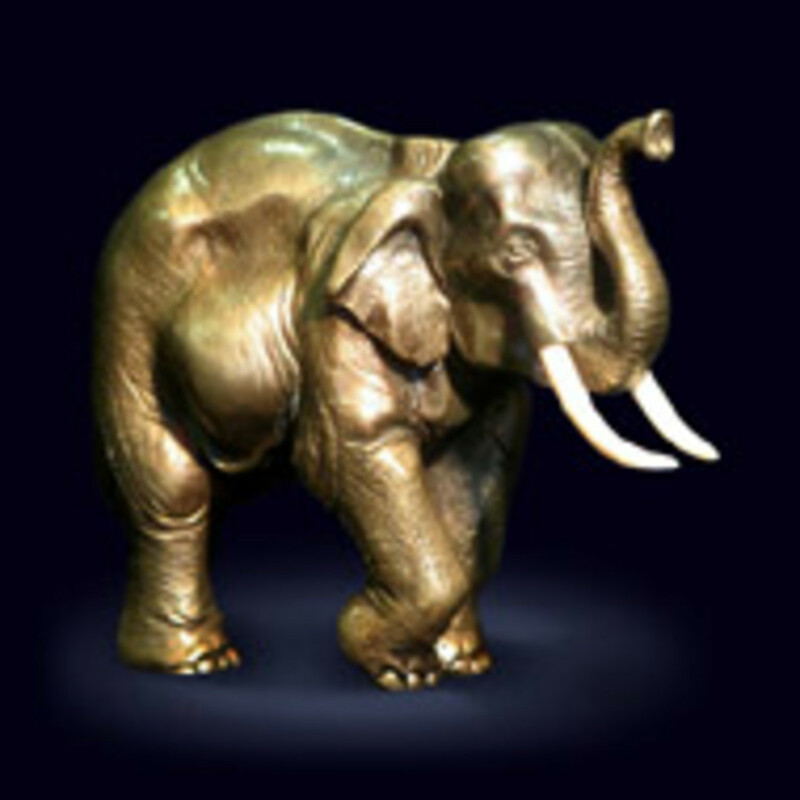 The statuettes and images of golden elephants symbolize caravan that brings wealth to your threshold. Finally, a turtle beside many other good things symbolizes wealth. If a turtle wanders inside your house, it is a good luck! 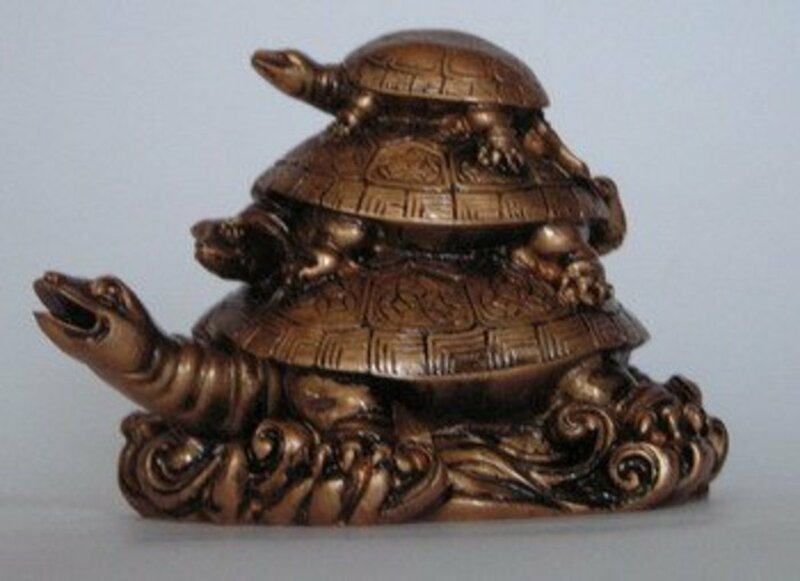 Let this beneficial animal find its way to your home by putting a statuette of a turtle in your dwelling: it will be a good decoration for any room's interior! I wish you the best of fortune! What is your favorite animal of good luck? None of these. I have my own lucky animal! 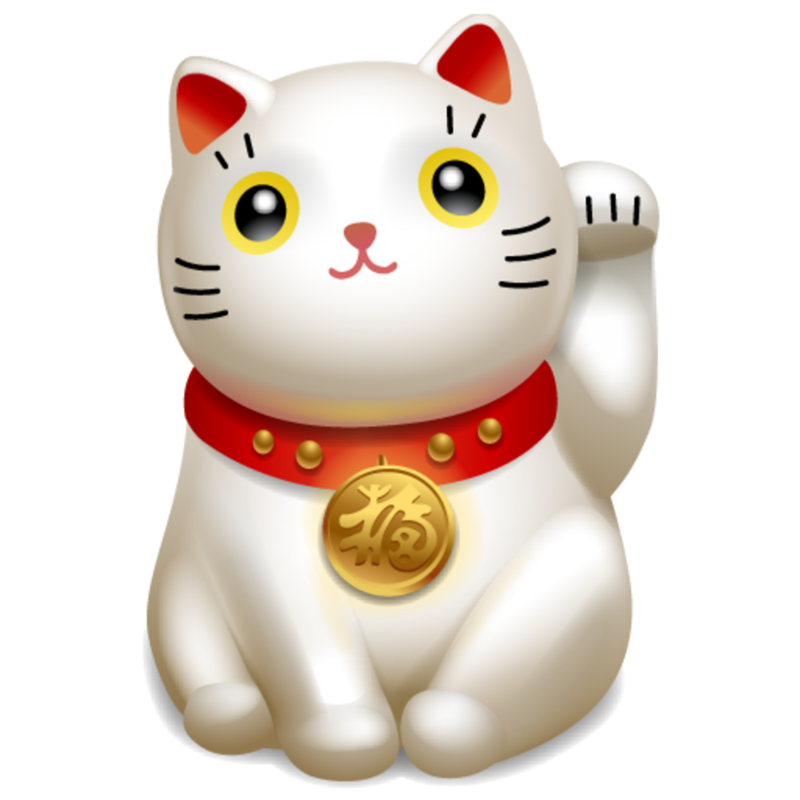 Maneki Neko literally means “beckoning cat” and it represents a ceramic or china statuette with a raised paw. It is placed in front of a shop, a playing hall, restaurants and firms. Do you know any other animals of good luck? According to my birth year I am Gemini and my Chinese zodiac is the year of dragon, what Feng Shui do I use for office table and also for marriage? Regarding the animals, it can be different according to the kind of energy that they bring to your home. Let's say a skin of a dead animal brings the energy of death and violence, also murder. That same does the image of a lion attacking a deer. So this is definitely not good feng shui. You can throw away your fountain or fix it. But don't keep broken things at home. 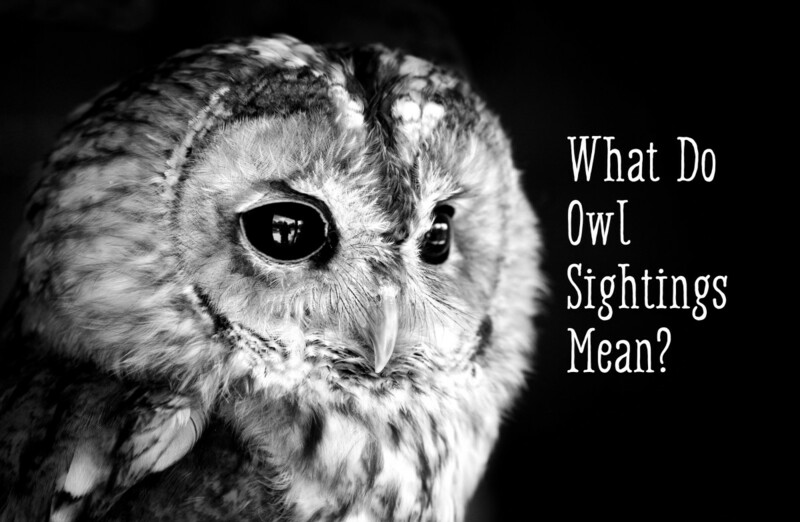 Not sure about owl symbolism in feng shui. The dragon is a goos symbol, its "home" is in the east area. i have 2 owl statues and placed it in the living room is there a good direction i should place them also can i place a dragon statue in the same area? What happen if scorpion enter in house? Is it a good sign or bad? I saw a showpiece of male frog sitting on a swing. Same way thr is female frog. Can I buy both the showpiece for my home. Mugil, in each particular situation a feng shui master can give an individual advice. In feng shui there is heavenly, earth and personal luck. Personal money luck is something you create by yourself and you can influence your heavenly and earthly luck a little. A feng shui master would see your house and give advice about it. Also he or she can build your ba zi chart which is a natal chart based on your date of birth. This may help to improve your general luck and money luck in particular. Hi, I have not followed anything described here, so any help would be fine. I am a Sagittarius. I have been through worse situation possible and now slowly improving without following any Feng Shui or anything. Not having any luck in wealth. Please let me know. hi. feng shui recommends to have an elephant with a trunk lowered or a dragon with a big belly - place them in the living room. wearing carnelian for a woman is great, peach symbolism is helpful. pictures of children in the huose - especially in the west sector. good luck! My husband born the year of a Horse and I am born in born the year of a pig. I have a question.I am struggling to get married with the person I like, since my family opposes him. Is there a cure in fengshui for that? Also, can I keep a golden horse or should I keep a white horse at workplace? My zodiac is Scorpio, Chinese zodiac is Dog. My DOB 280567. I need your help to way to prosperity. Pisces is a sign of western astrology. Feng shui deals with eastern astrology, which can be quite different in many ways. As much as I know pisces are known as dreamers, mistics and artists. So any kind of creative work is great for them. The shadow sign of pisces is Virgo though, who is the master of detail. Pisces feel more complete is they give more attention to little things. My zodiac sign is Gemini. In Chinese horoscope I am horse. I am looking for a soul mate a true relationship marriage. What symbol animal should i put at home and jewellery to wear . I am also planning to get a tatoo .. Will the dragon tatoo be a good luck charm for me? Please help. True Love has never really favoured me much. are tigers sign of bad luck? I brought artificial camel...Nd live gold fish ...Wat it represent??? Hi, today, I was given a horse (looking down with four feet on a pedestal) by one of the owners of the family owned company I work with. She said that she had this horse statue displayed at her house and now that they are renovating, thought that she would give it to me for so many favors I have been doing for her companies. Would this add to my great luck or should I sell or give it away? Hi. You are right about bad feng shui of the entrance. First let me ask you - no offense meant - why did you choose the house if you knew it was bad feng shui? Now if you have no choice, the best thing to do is to screen the staircase. The black colour of the door on the west is not really so bad, although it's weakening fo rthe metal element of the area. But the main thing is that the black colour is not domeneering here. Keep the door of the toilet closed and decorate it nicely. Any curvy plant-like decor ofr the stair case will correct a little, as well as windchimes. Everything in feng shui is symbolic. Two cranes are a good sign by itself but facing away means different directions, so it is better to place them facing each other. This way people living in the house will be pursuing the same goals. Hi! We're moving to a new house. I have few concerns with the layout. This is a newly built house. My main door is black and facing west. As soon as you open door, you will see both the staircase and the downstairs toilet. Dining /kitchen on the left with the same wall as the toilet. What can I do to counteract all these that I think are bad fengshui? Please, please help me. Email me if you can at lot_agcaoili120802@yahoo.co.uk Thank you very much in advance.! Hi Marge! I'm happy for you that you found feng shui useful and helpful. 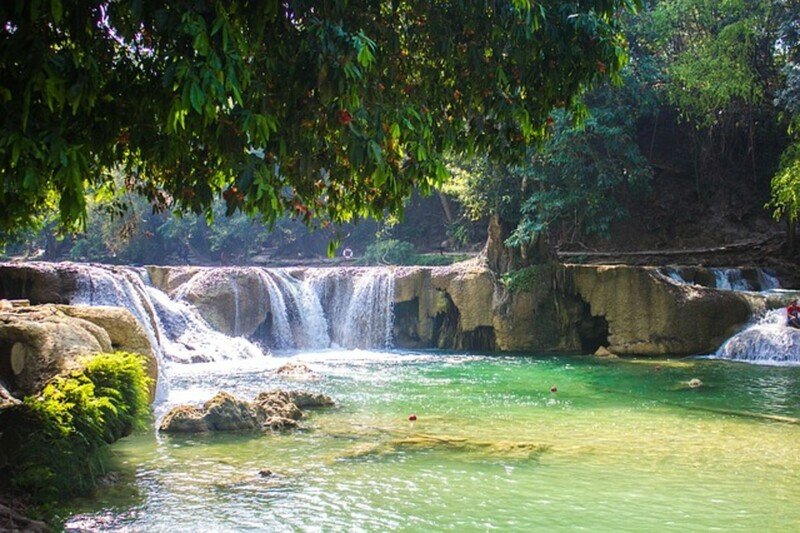 You really describe it well: with feng shui, you go with the flow. It's because feng shui improves your earth luck and human luck, and sometimes even heavenly luck. 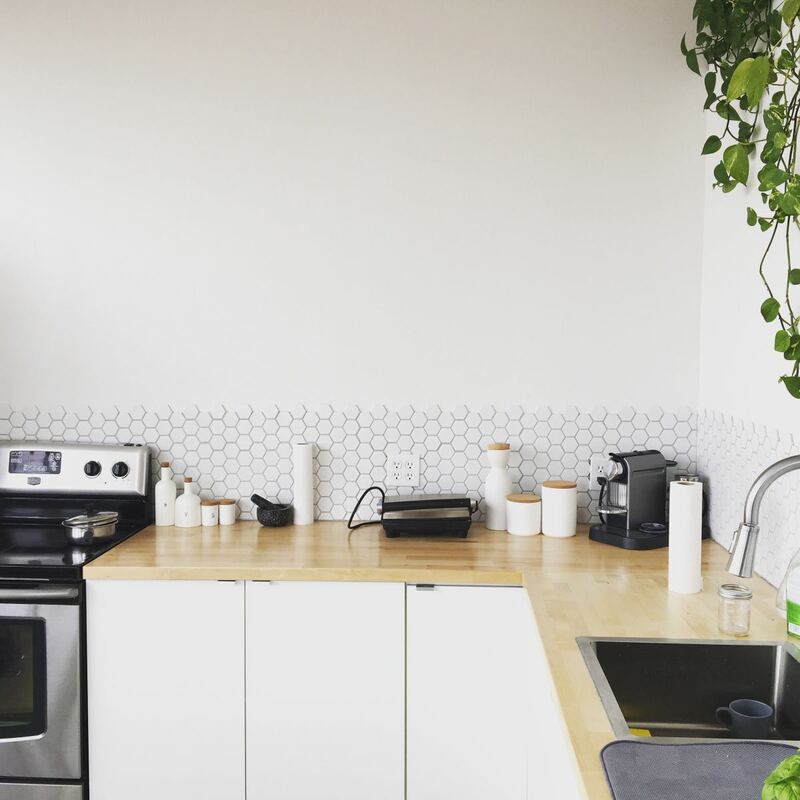 I was initially leery about Feng Shui until a friend swore things changed after reading Lillian Too's Living with Good Feng Shui book and applying it into her day-to-day life. Googled it and found a copy from Noon Books (www.noon-books.com). I thoroughly enjoyed reading it, applying it and waiting for positive results. I swear life seems to just "flow" now instead of just "chug along" if you know what I mean. Money comes in from unexpected sources and relationships seem to require no effort. Life just seems happier. I can't explain it, but it works. I guess at the end of the day that's what it all boils down to. Very, very thankful I stumbled upon this and gave it a chance. hi. depending on the type of post it can be more or less negative. if you have one of a round shape, it's better. rectangular shape is worse. anyways, if you can cut it, do so. for the bathroom, keep its door closed and hang bells over it. Hello, I live in a split level home. I recently bought two cranes to place outside. I have a wooden post that is floor to ceiling in my health section, what can I put on this post to counteract negative energy? Do you recommend cutting down? It does not hold my ceiling up :). Also I have a bathroom door connected to my bedroom, I worry this brings negative energy too since my prosperity area is in my bedroom. Sure, camel is a great good luck animal that helps survive hard times with some profit. Go for it! I would suggest to deplace your horse from home to the office, but in the south of the office quite descretely! Hi. Turtle is indeed a great career helper. It is ok to have a new turtle if the old one died. Don't bury it though close to your home, otherwise it will give a sense of cemetry and harmful yin energy bad for life. Light some candles where it used to live also or ring a bell. This will give light and higher vibe to the place. We had a pet and its a turtle, and I realize when my nephew bought the turtle my husband's business grew. Unfortunately our pet turtle just died this morning. Is it ok to buy n new turtle pet? Hi Prakash. Can you check if the horse is actually facing north or is in the north sector when one of your family members is born the year of the Rat? If so, it is good to change, especially if the statuette is in the north. North is the sector of the Rat, and the Horse is Rat's enemy. If the face of the horse is the first thing you see from the entrance, it may not be as good either. Horse symbols bring very powerful kind of energy, horse rearing is kind of sending chi energy back from your home. It is better to have your horse in a home office or even living room. The home of the Horse is south. But you can place it in the north for career success, only if nobody in your family is Rat. I have a golden color rearing horse on a wodden base situated in a position were the face of the horse is opposite to my home's main door is it good? The family atmosphere in my home is not that good what can i do for that. from the viewpoint of the western zodiac lion is your lucky animal. However feng shui considers your Chinese zodiac sign. So find it out and have another lucky animal at your disposal! Hi Joy. I can tell your Chinese zodiac sign by the date of your birth, including year. There is a lot of information online on the subject, and you may easily find it yourself. Elephants are great for feng shui. They protect and bring good luck to your home. If they are wooden it is a good idea to place them in the south, south-east or east of your home. Hi Avorodisa, my Kodiak sign is Taurus, what is my Chinese animal and what should I wear or place in my apartment to bring me health, wealth and happiness? I have some wooden elephants that was given to me but I don't know how it works. Hi Prabs, feng shui is an Eastern system of knowledge and it is different from the Western one. Keeping goldfish is beneficial in feng shui, and if you believe in it, twice so. So keep on keeping your godlfish by all means. My zodiac is scorpio. Will keeping gold fish bring me bad luck?? Hi again Renuka. Fenh shui has several remedies that you can try to have a child. The basic ones are Kuan Yin, peach and some stones like carnelian and red jasper that you can wear. Kuan Yin is the goddess of mercy and many great things, one of which is childbirth. You can have an amulet-pendant in the form of Kuan Yin from carnelian, for example. Peach can be a figurine that you can buy in a feng shui shop. Place the peach near your bed. Laughing Buddha with children is said to help. Finally, some feng shui masters recommend placing a pregnant (round-bellied) dragon in the east corner. Also, elephants with lowered trunks help get pregnant. Good luck. Hi Renuka. 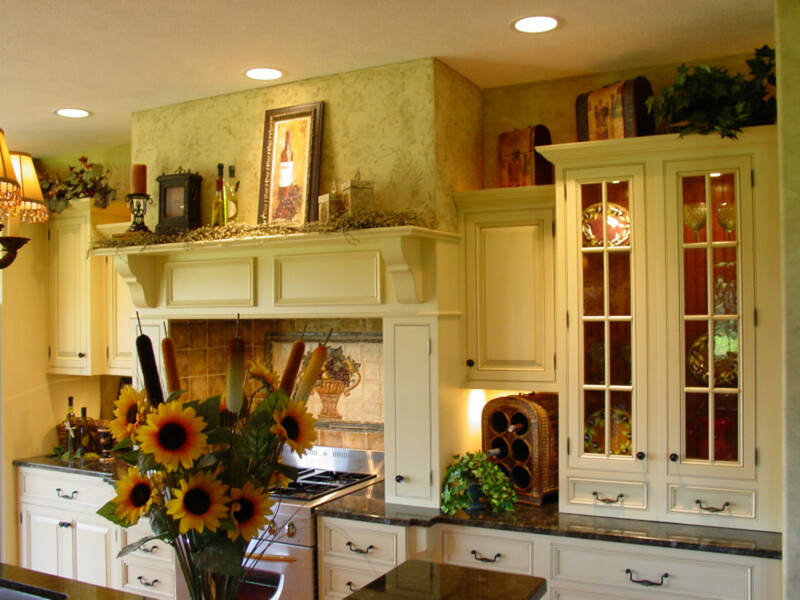 Wow, that seems like lots of things to me) But your wall unit is all good things. In feng shui a nicely decorated wall is always a plus. There is even a notion of the main wall in the room. This is the wall that is mostly looked at, the most visible and prominent wall of the room. If decorated properly, it brings wealth, luck and happiness to the residents. Your shelves seem beneficial to me. However, you mentioned religious objects (buddha, hindu gods, king). These should take a higher place on the highest shelf. Humans are smaller beings, so place them on the middle shelf. Animals are still smaller beings, so place them on the lowest shelf. Mind that as gods are respected, don't place them lower than eye sight. As for the wall placement, it doesn't really matter where it is if it is nice, pleasant to look at. Just east is the family direction, so by having this wall in the east you will boost family well-being, and if you place it in the north, it will help career. Hi, in feng shui horse and rat are two signs that collapse. This means that people who are born under the sign of rat are not recommended to have a horse as a symbol in their home. Especially don't place it in the north area of your home as this may be unlucky for you. North is the rat sector, so having a horse symbol here will bring conflict. Likewise I would be careful putting horses in the south, even though it's horses's home. See they would oppose north which is not good either. Try placing them anywhere else. Buddha is good as well as turtle. This symbol may be helpful especially in the north unless you have a bedroom here. If you have a bedroom in the north, place the statue in the north of your living room to boost your career growth. North has a lucky 8 star this year 2015, so be sure to activate it. Rat symbol is good for you to wear as body jewelry, as well. Unless one of your family members is born on the year of Rat according to the Chinese zodiac, having two horses in your living room seems like a good idea. Horses boost reputation, recognition, fame and social status. It doesn't really matter which direction they face, but it's better if they look inside the room rather than outside for the fame luck will come inside your home. Also it's a good idea if they decorate the major wall of the room. The major wall is the one most open, most looked at in the room. I am planning to make wall sculpture of 2 horses in my living room wall. The size of these two horses running / galloping will be about 6 feet. My Living room window in on the south side. Should the horses be facing the window or towards the inside (north side). I have read a lot online but am getting confusing / contradictory ideas from several articles. Living Room is on 4th Floor. Would really appreciate if you can give as detailed reply as possible. yes. it's a good idea because south is the corner of the horse. it will enhance the energy of the south sector and bring more fame and recognition to you. Thank you for sharing your experience, Kristen Howe. By the way, stuffed animals are considered bad feng shui, as dead bodies emanate negative yin energy. Otherwise, any symbols that are not killed animals but just figurines, images, etc. are great feng shui. This was real interesting to know. I've gotten invested into feng sui last fall, before I moved. My late mother loved elephants--it became our family symbol. She collected everything from figurines to stuffed animals. Now I keep them in part of tradition. I just need to find them in metallic ones, someday. amel, yes sure. you can put the charm in the living room on a high standing position, for example. Hello I planned to buy the 8 lucky charm introducing above images. any of them I can put anywhere corner of the house?. My birthday is December 11,1989. Thank you hoping for the positive respond. what amulet can i wear for good health, prosperity. hi, haroon hussain. both tortoise and elephant are lucky regardless of your zodiac sign. i want to ask my date of birth is 02/08/1989 i am a leo. which animal shall i get tortoise or elephant to bring good luck, in my home. Waiting for my lucky toad to invoke the voluptuous hypothesis and make me rich! I want to buy a house . Just want to keep a lucky charm so that i get new house soon. so plzz suggest what is the lucky charm to buy new house. I can recommend you for making friends and mates place your animal-friend in the corresponding area of your home. You were born the year of a pig, so place a picture or a statuette of a rat in the north of your apartment or house. Rat is your animal-helper when it comes to love, friendship and co-thinkers. In feng shui this is called "peach blossom formula", although it has nothing to do with peaches, lol. The fact is, they compare the beauty of the face of a beloved to a peach blossom. If you want to buy a special ring to protect you and bring good luck to you, using Chinese zodiac I would choose a pig ring, your animal sign. Good luck! First of all, I am sorry for my English writing. Nowadays , I feel lonely no friend , unhappiness although I try to create relationship and my study isn't good at all too. How can I do to solve this problem ? I was born at the year of pig. One more , I decide to buy fengshui ring, can you tell me which symbol on the ring is good for me? Dragon ring or frog ring? Is it ok if I wear snake ring? Once again thank you so much for such a profound explanation I appreciate your help .You doing a tremendous aid those who trust in fengshui and need . By the way my apartment is rented so I am afraid i can´t paint perhaps owners won´t permit me .Right now my apartment colored in very light sandal color.Regarding the horses is there a concern numbers of horses . Hi Avorodisa how are you ? Thank you so much I appreciate your time and reply .Sorry to say I don´t grasp this concept bagua .Actually I live in an apartment my main door which is facing Northeast,In this case what I suppose to do..Another question is there any rules apply regarding the colours of horses. Kindly can you advice me. Hello, @gknrajan, thank you for the question. 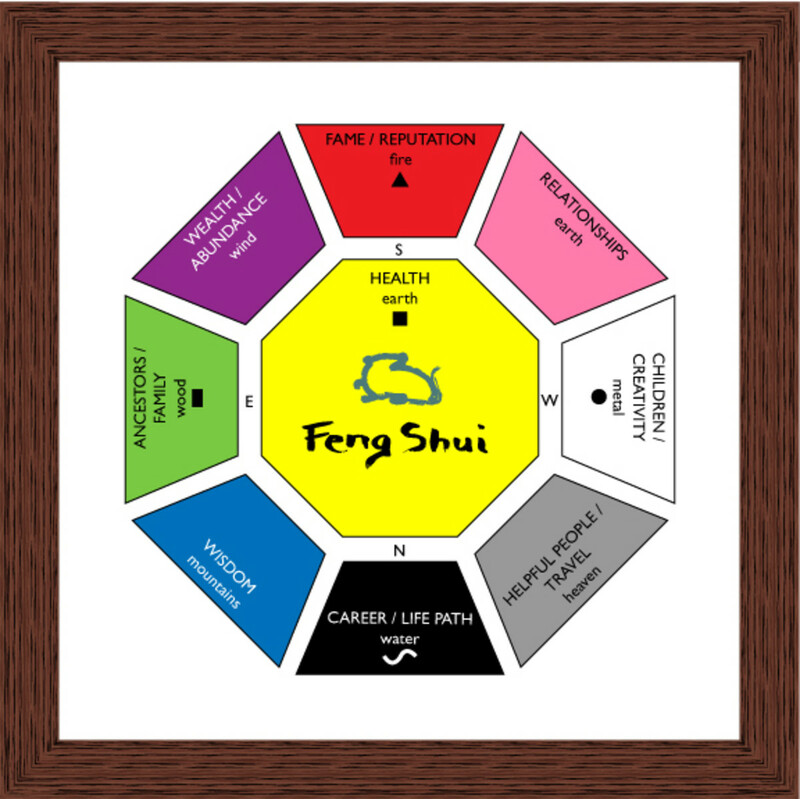 I am new to Feng Shui ,I have few questions i wish you will be happy to answer me and clear my doubts .Since i have trouble in my career and to obtain success in my life is it good to have Horse statue or painting like rearing ? If so how many horses I should keep as a statue as well in painting or can you advice what type of feng shui symbols please. that's a good question, sonu jain. There are two areas where you can place a horse, according to feng shui. As an animal of fame, it can be placed in the south of your bagua. As an animal of career luck, a horse statue or picture can be placed in the north. However, if your Chinese animal sign is Rat, don't place a horse in the north. When it comes to laughing Buddha, place him in the living room facing the door. Hotei will bring you money luck, lightness and take some problems away. Hi! Can I know where should I place a horse and a money happy man? And in what kind will it get me a good luck? Both one-humped and two-humped camels are good feng shui, as far as I know. Camel as a feng shui symbol personifies wealth luck, indeed. Metaphorically a camel is often compared to a wealth ship that sails through a desert. What a powerful comparison, don't you think? A camel with one hump will protect your finance and make your wealth stable. A camel with two humps helps overcome financial difficulties. That's why many businesses would use a pair of two different camels as beneficial symbols. The best place for a camel is south-east of your home or office, which is a wealth sector. You can place it in the north-west also to support the man in the house. We have bought a single humped camel statue. .but later one of our relative said that it is not good for wealth..what would you suggest Sir/Ma'm? Hi indrani. Thanks for your question. A turtle is a very beneficial symbol of many good things, especially career. You can place it in the north area of your bagua at home or in your office. mansi, thanks for the question. as far as I know tortoise can be kept out of water. it is good to keep the symbol on the north of your home. Hi Heisel, thanks for loving feng shui. Hi , love everything about feng shui , I feel alive every time I think about this subject , I'm not an expert about it but I really love it . Amalia, there are many ways in which you can enhance your love and career luck, according to Feng Shui. One way is to know your Chinese zodiac sign, which is Wood Dragon, and find charms in accordance with your birth element (wood) and your zodiac animal sign (dragon). You may also use general charms for wealth, like citrine stones, laughing buddha or fountains (which symbolize money flow). Speaking of home feng shui, you need to know where to place them though. If you want to help yourself with body feng shui, wear stones like citrine, crystal stones, images of your own zodiac sign and other friend signs. Lakshmi is a very powerful deity when it comes to wealth. You can place Her in the south-east of your home. Traditionally 3 coins attached to a red string in your purse are a very powerful wealth charm. Love luck can be improved by happy couple images in your bedroom, hieroglyph sign of double happiness, pink quartz mandarine ducks. Wearing beautiful lingerie is another great way for singles to attract love. Having some empty space in your wardrobe is also helpful. Good luck to you in whatever way possible. My kitchen walls have very high ledges and I have placed a two foot angel and my biggest gargoyle on them. When I placed them there I did it for them to protect us. I didn't really know that gargoyles did this. I will take them down to dust them and I will tell them to protect us. Thanks for your question, Deborah. I find gargoyles fascinating. They decorate the walls of so many cathedrals in Europe, including Nottre-Dame de Paris. As far as I know gargoyles don't come from Chinese mythology. Yet, they have bat symbology in them (they have bats' wings) and bats are beneficial, luck bringing animals of feng shui. Also, gargoyles have a guardian aspect to them. In fact, anything meaningful to you in feng shui brings you the energy that you feel about them. There is one feng shui trick. Before you even place a symbol in your home you need to tell your symbol what function they are supposed to do. This way you program them to help you. You may "tell" your gargoyles to protect you, for example, for better home protection))) Have fun. Do gargoyles do anything? I have a collection of them from very small to three feet high. Alby, Feng Shui is not about the zodiac of the twelve astro signs of the year. kundan gupta, pearl is a beneficial feng shui symbol. yet, your frog needs to be three-legged. otherwise, it's not really a feng shui symbol. i am wearing a ring on which a white pearl situated in front of frog mouth. frog is having 4 legs. so is it good for me to wear or not. Nina, you may need to invite a Feng Shui specialist as business Feng Shui needs extra attention. my husband and i are both are scorpions.we run a business (designing firm and sales).From 15 January 2013 our business is going down and we are losing customers, due to this we are facing a huge financial loss.we in a rented office which have 2 washrooms one is in north-east corner and other one is in north-west corner.how can we bring our customers back and have a prosperity and financial growth in business? please help.